A new Morris 1300 Traveller in Sandy Beige purchased at Mears Garage. Homepage. This page: Mears Garage of Newfound, Basingstoke, sell a new Morris 1300 in 1969. Sold, a new Morris 1300 Traveller in 1969. Invoices relating to the many car purchases by a Mr Hatcher already appear in this section of the site (Vauxhalls in the main). In 1969 he switched to the products of BLMC, and invested a total of £870 0s 0d in a brand new Morris 1300 Traveller (estate), finished in Sandy Beige colour. To the base price of £844 7s 6d, he added extras such as undersealing (£13 10s 0d), a tow bar (£7 10s 0d), reversing lamps (£4 0s 0d) and seat belts (£7 10s 0d). All the Austin and Morris 1100/1300 models and derivatives had a well-deserved reputation for rusting - as did most cars in that era - so perhaps it was appropriate that Mr Hatcher's 1300 Traveller was registered ROT 875G. Subframes and their mounting points were favourite areas to rust away. Perhaps the optional underseal treatment helped stave off the attentions of the metal moth, but this particular car no longer appears on the DVLA's site of registrations, so presumably it went to the great scrapyard in the sky many years ago. For whatever reason, the car's new owner can't have been that impressed with it, as another old invoice relates the fact that the Morris was part-exchanged against a new Renault 6 later that same year, 1969. Example of Morris 1300 Traveller. 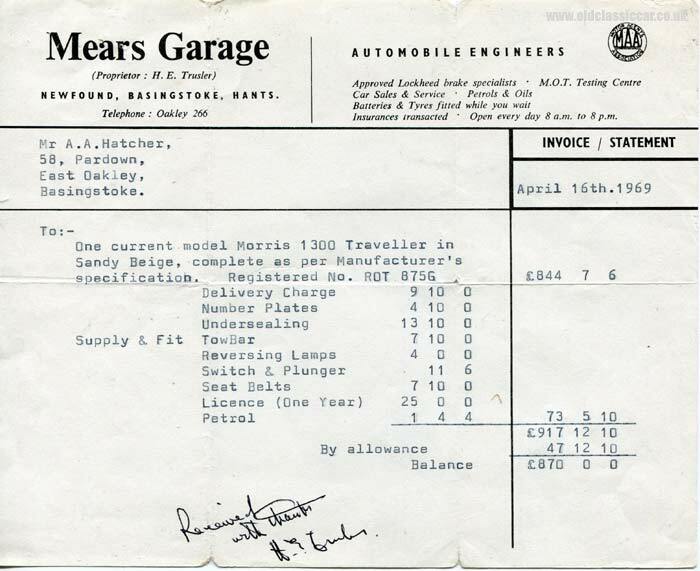 Unlike earlier garage invoices featured, which tended to be handwritten in ink, this 1960's example was typewritten, and signed by the proprietor of Mears Garage, H.E. Trusler. The business was situated in Newfound, Basingstoke, Hampshire. In addition to the sale of new cars, Mears was also an approved MOT testing centre, and an authorised Lockheed brake specialist. Petrol and oil could also be purchased at their establishment, the company being open for business seven days per week, 8am until 8pm. Looking around, there appears to be a business of this name still trading today in the Basingstoke area. The Austin Countryman and Morris Traveller versions of BMC's best-selling ADO16 line went on sale in 1966. A two-door rather than four-door design, it proved to be a popular and capable mid-sized load-lugger, all steel unlike the woodie Morris Minor Traveller of the same era. And unlike the Minor, the 1300 had a single rear door, hinged at the top, rather than two side-hinged doors - all-in-all a much more modern design, although both models shared A-Series running gear, transversely mounted in the case of the 1100/1300, and longitudinally in the Minor. There was talk of a van version of the ADO16 going into production, and in fact a batch of prototypes were produced, based on the estate's design. Initial impressions were in the main favourable, and it seems like a logical decision to produce an 1100/1300 van, designed to slot in above the Mini van. Problems with the Hydrolastic suspension when the vans were loaded up were never overcome, and perhaps the existence of Minor-based vans already in the line-up, led to fully developing an 1100/1300 light commercial never becoming a top priority. Return to the Motoring Collectables section for more garage and car-related literature.